Diabetic retinopathy is an ocular microangiopathy. Epidemiology: Diabetic retinopathy is one of the main causes of acquired blindness in the industrialized countries. 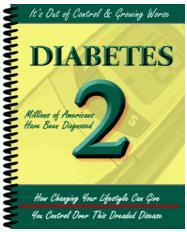 Approximately 90% of all diabetic patients have retinopathy after twenty years. (Table 12.1) is based on the classification of the Diabetic Retinopathy Study. A distinction is made between nonproliferative stages (1. mild, 2. moderate, 3. severe; Fig. 12.14) and proliferative stages (1. non-high-risk 2. high-risk; Fig. 12.15-12.17). Fig. 12.14 Microaneurysms, intraretinal hemorrhages, hard exudates (arrow), and cotton-wool spots (arrowheads). 316 12 Retina Proliferative diabetic retinopathy. Fig. 12.15 a Preretinal neovascularization (arrows) is a typical sign. b Corresponding angiographic image. Fluorescein dye leakage is seen in the neovascularized area (arrows). 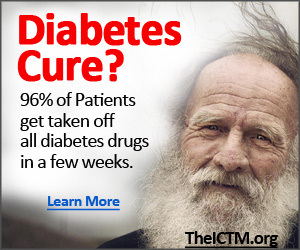 Symptoms: Diabetic retinopathy remains asymptomatic for a long time. Only in the late stages with macular involvement or vitreous hemorrhage will the patient notice visual impairment or suddenly go blind. Diagnostic considerations: Diabetic retinopathy and its various stages (see Table 12.1) are diagnosed by stereoscopic examination of the fundus with the pupil dilated. Ophthalmoscopy and evaluation of stereoscopic fundus photographs represent the gold standard. Fluorescein angiography is used to determine if laser treatment is indicated. The presence of rubeosis iridis is confirmed or excluded in slit-lamp examination with a mobile pupil, i.e., without the use of a mydriatic, and by gonioscopy of the angle of the anterior chamber. — High-risk proliferative diabetic retinopathy. Fig. 12.16 The clearly visible vitreous hemor rhage seen here (arrow) is a typical sign of this stage of diabetic retinopathy. The patient will only notice deterioration of vision in this later stage. 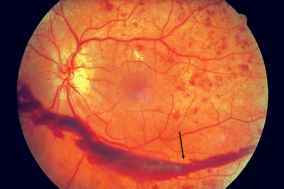 Differential diagnosis: A differential diagnosis must exclude other vascular retinal diseases, primarily hypertonic changes of the fundus (this is done by excluding the underlying disorder). Treatment: Clinically significant macular edema, i.e., macular edema that threatens vision, is managed with focal laser treatment at the posterior pole. 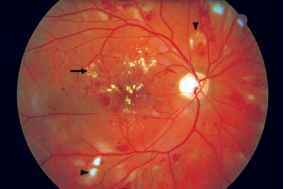 Proliferative diabetic retinopathy is treated with scatter photocoagulation performed in three to five sessions. Prophylaxis: Failure to perform regular ophthalmologic screening examinations in patients with diabetes mellitus is a negligent omission that exposes patients to the risk of blindness. Therefore, all type II diabetics should undergo ophthalmologic examination upon diagnosis of the disorder, and type I diabetics should undergo ophthalmologic examination within five years of the diagnosis. Thereafter, diabetic patients should undergo ophthalmologic examination once a year, or more often if diabetic retinopathy is present. Pregnant patients should be examined once every trimester. 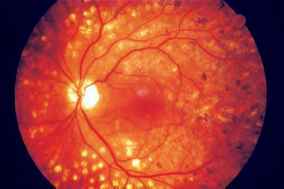 Clinical course and prognosis: Optimum control of blood glucose can prevent or delay retinopathy. However, diabetic retinopathy can occur despite optimum therapy. Rubeosis iridis (neovascularization in the iris) in proliferative diabetic retinopathy is tantamount to loss of the eye as rubeosis iridis is a relentless and irreversible process. 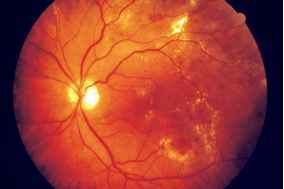 H The risk of blindness due to diabetic retinopathy can be reduced by optimum control of blood glucose, regular ophthalmologic examination, and timely therapy, but it cannot be completely eliminated. 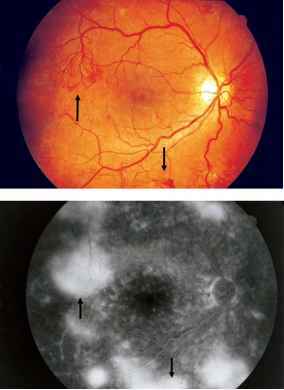 318 12 Retina Proliferative diabetic retinopathy before and after laser treatment. Fig. 12.17 a Proliferative diabetic retinopathy with clinically significant macular edema before laser therapy. b Findings after successful laser treatment (laser burns appear whitish brown).